iJust 2 atomizer features a large e-liquid capacity of 5.5ml. 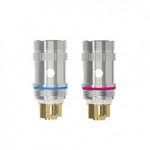 To cater to different needs, the new iJust 2 Mini atomizer comes with a smaller e-liquid capacity of 2ml while still retaining the unique atomizer base of special structure for better heat dissipation. When working with EC series coils, the iJust 2/iJust 2 Mini will bring you a great joy in vaping. 1. 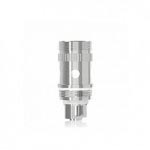 EC head is adopted in iJust 2/iJust 2 Mini atomizer, which is consisted of two heating coils vertically placed in parallel. It enables a large amount of cloud production;EC TC head adopted in iJust 2 TC atomizer makes the atomizer compatible with various temperature control devices. 2. There are two choices of e-liquid capacity for you to choose: 5.5ml for iJust 2 atomizer and 2ml for iJust 2 Mini atomizer. 3. The special structure design for the iJust 2/iJust 2 Mini atomizer standard base improves the heat dissipation capacity to a large extent. 4. The amount of airflow can be adjusted by rotating the airflow control ring on iJust 2/iJust 2 Mini atomizer standard base so as to get different vaping experiences. 5. Pure organic cotton is used as the wick of both EC head and EC TC head in order to produce a pure flavor. 6. There is another four-hole atomizer base as spares for your option. First unscrew the atomizer base off the atomizer. Then slowly refill e-liquid into the atomizer along the tube. At last, screw the atomizer base onto the atomizer. c) Please don't vape until e-liquid nearly runs out. Otherwise, the cotton wick inside will be damaged. Our products may contain nicotine, a poisonous and addictive substance. Our products are only intended for committed smokers of legal smoking age and not by children, women who are pregnant or may become pregnant or any person with an elevated risk of, or preexisting condition of, any medical condition which includes, but is not limited to, heart disease, diabetes, high blood pressure or asthma. Eleaf makes no claims that the electronic cigarette will cure a smoker's addiction to nicotine. Shajing Town, Baoan District, Shenzhen, China.